Bring a large pot of water half full to a boil, add the broccoli and the string beans, allow to steam. Drain the water after 5 minutes and turn heat down to low, add remaining ingredients except sardines, mix well and let cook another 5 minutes. Plate the dish and serve with sardines on the side as an option. Other ideas for serving add more olive oil, hot peppers, serve with rustic bread, rice etc. This is just a very basic risotto recipe and then just add a can or two of sardines depending on serving size and who may prefer the canned fish. Alternatively you could use canned tuna or salmon. 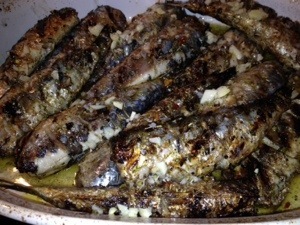 You could use sardines packed in oil, but I like the ones in water then I can use my own Greek extra Virgin olive oil. 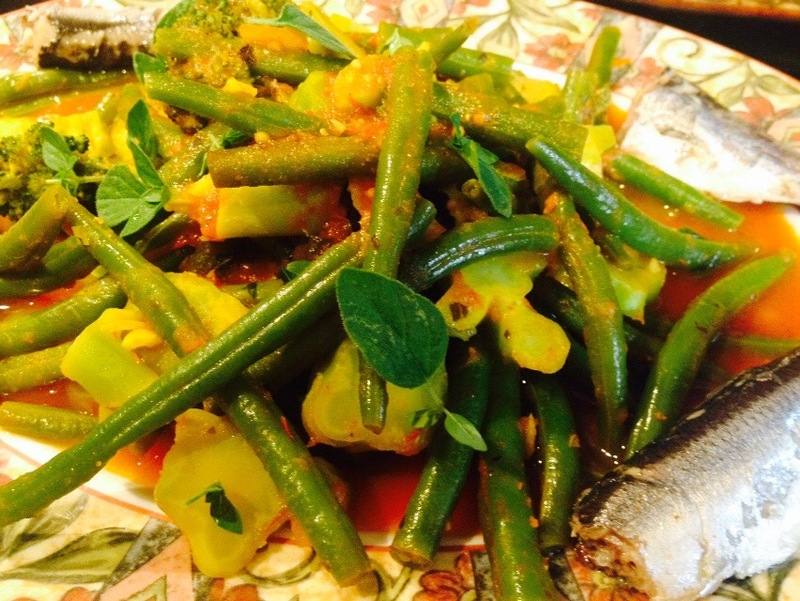 There’s so many options as you could use sardines in sauce with the chilli pepper for a spicy kick. In a medium size pot heat the 6 cups of veggie or chicken stock/broth until hot and keep it warm, on the other burner heat the olive oil and one tablespoon of butter over medium heat add the celery and shallots and garlic stir with a wooden spoon for about 3 minutes, add the rice and toast for a few minutes constantly stirring, now add salt, basil and 1/2 cup of hot broth, continue to stir, as soon as you see liquid evaporating in rice add 1/2 cup of broth at a time until rice is al-dente and creamy about 20 minutes. Turn off the heat stir in remaining tbsp butter and cheese if using, taste rice and adjust seasoning if needed. Cover pot of risotto and let sit for 5 minutes while getting table ready with the sardines, olive oil, more cheese, bread etc. 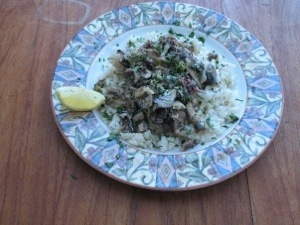 plate risotto and allow people to help themselves to sardines, olive oil, lemon or cheese. Depending on the rice you have broth leftover as after rice has cooked not all of the soup stock was needed. Fresh Sardines are hard to find, but frozen ones are available at fish markets and some grocery stores. One package frozen whole sardines, there’s usually 12 in the pack, each are about 6″ long or fresh ones if available. If using frozen fish allow to thaw. Take the sardines and rinse in cold water, if you would like to keep the heads on that’s fine, I like to cut the heads off at the gills and discard the head. With a sharp knife score the body of each fish 3-4 times about 1″ inch apart for each score. Place fish on one layer on a tray. Prepare the sauce by combining all the other ingredients and mix well. Pour half of the sauce all over the sardines and mix sardines well to coat with hands. 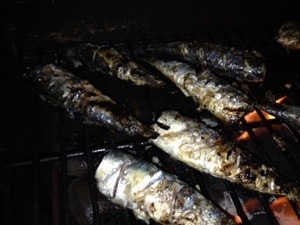 allow sardines to marinade to 30 minutes. Prepare BBQ for grilling by preheating for 5-10 minutes on medium to high heat. Brush grates with oil. 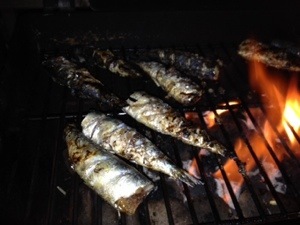 Slowly place each fish on grill and careful not to let flame catch on fish. Grill fish by turning once 3-4 minutes per side. Fish is ready when meat easily flakes off with touch of a fork. 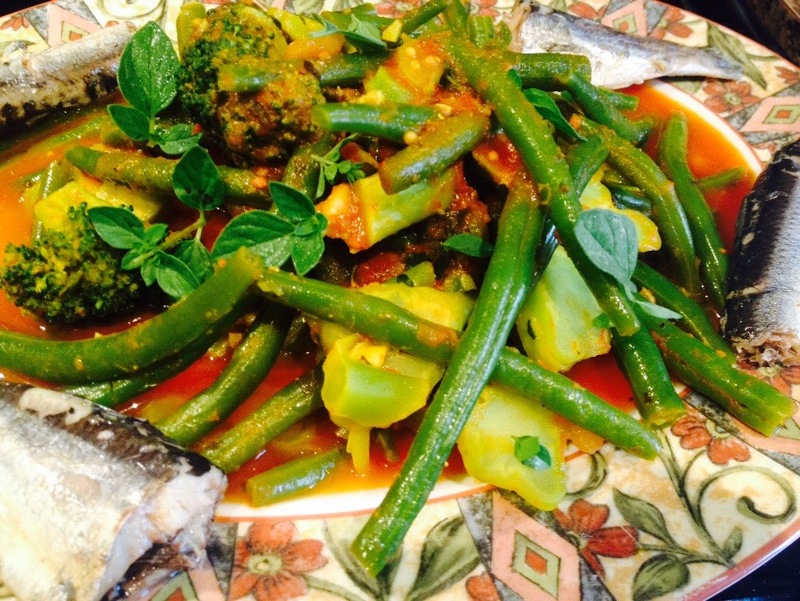 Once ready place fish in serving platter and drizzle remaining sauce on the sardines. 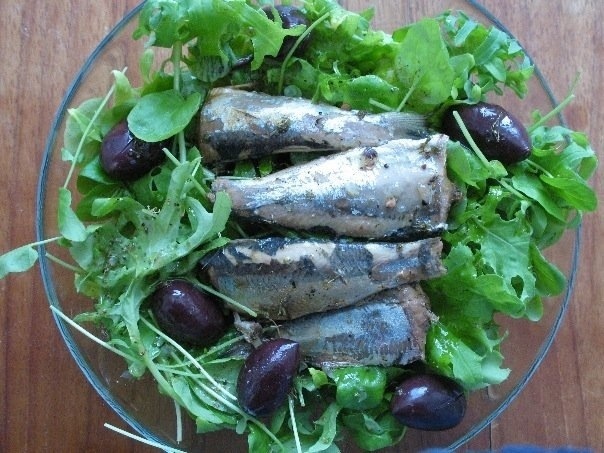 Drain water from sardines and place all ingredients in a bowl, top with sardines, drizzle with olive oil and the vinegar and serve with crusty bread.